ITW Dynatec is excited to launch a new line of precision slot die solutions for the Coating and Laminating industry – ExactCoatTM Precision Slot Die – our Turnkey Precision Hot Melt Slot Dies! ExactCoatTM – the new line of precision slot dies – includes flex lip and rotary rod with flexible lip versions. ITW Dynatec will also offer positioners and a complete coating station. The new system will provide state-of-the-art solution with thinner and faster techniques as well as Adhesive Delivery System technology. 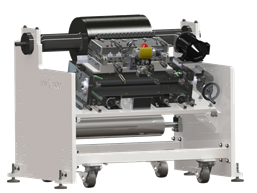 ITW Dynatec’s Precision Hot Melt Slot Die system has guaranteed application performance resulting in faster production speeds and reduction of adhesive usage! This highly-accurate and reliable system prevents streaking, permits ultra-thin coatings and maintains industry leading coat weight accuracy. In addition, it provides real-time monitoring of both pressure and temperature in the die! “In the hot melt slot die coating market, 98% of all the applications are a contact slot die, and ITW Dynatec now will play a significant role in the market with the addition of ExactCoatTM.” Explained Mr. Michael Budai, Coating and Laminating Sales Manager. ITW Dynatec is a global company that designs and manufactures a full range of hot melt applications for the disposable hygiene products, coating and laminating, and packaging industries worldwide. The company’s state-of-the-art technology is backed by a worldwide network of industry-leading customer service and support. For more information, visit www.itwdynatec.com.